Evangelist Emmanuel Toluwase Akeredolu is one of the most respected ministers of God in Christ Apostolic Church Worldwide. Few weeks ago he was transferred to Ilorin DCC by the authority of CAC Worldwide having spent three years as DCC Superintendent of Somolu. In this interview with ‘Gbenga Bankole, Evang. Akeredolu speaks on fake prophecy, fake prophet, 2019 general elections and some other interesting issues. EXCERPT ! It is uncommon for a DCC Superintendent in CAC to be called an Evangelist. Why do you prefer to be called an Evangelist, why not Pastor or Prophet? Evangelism is my calling. I am an Evangelist and many years now those who are close to me call me Evangelist. It is those who don’t know me that call me Pastor. If you really want to address me, call me Evangelist. These days, it seems people no longer believe in prophecy. What do you think could be the reason? Two things are responsible for this. Number one, people are no longer reading the Bible. If you read the Bible on daily basis, you will know in the Bible there are prophecies that came to fulfillment. For example there were prophecies about Jesus Christ before His birth in the Bible. If you are a Bible student you will believe in prophecy. Secondly, there are lots of fake Prophets in the world and that is why their prophecies don’t come to fulfillment. I remember in one of my teachings on television many years back, I mentioned 7 signs to identify fake prophets. When you know those seven signs you will easily identify fake prophets. If I prophesy and truly it is from God, it will come to fulfillment. God cannot speak and say He is not saying it again. Prophets hear directly from God and deliver the message unto the church. Today there are a lot fake prophets and prophecies outside there. If I prophesy into your life and there is nothing to show for it, you won’t believe me again. It is as if you are mocking yourself to tell people these days that you are a prophet. The two points are the reasons why people don’t believe in prophecy. Cuts-in: You mean every prophecy from God comes to reality? It will come to reality. There is what I called “Environmental Prophecy.” For example if I heard there is a quarrel between you and your friend, instead of me asking you directly, I told you that God told me you should be very careful with your friend. That is an environmental prophecy. You said that prophecy from God will always come to fulfillment. Does that mean that prophecy can never be averted? It can be averted. For example if God says someone is going to die or a particular city is going to be destroyed by fire, it can be averted by calling upon the Lord. If God tells someone who is an armed robber that he will be killed in the next robbery, it can be averted. The person just needs to give his life to Christ and stop doing it. Prophecy can be averted if we pray to God. What is your opinion regarding different prophecies coming from Prophets regarding the winner of 2019 presidential elections? Thank God you are not asking who is going to win because I am not going to answer. There are lots of prophecies about the election these days. Some said Buhari is going to win; while others said it is Atiku. Somebody asked a question this morning on WhatsApp that how many Gods do we now have? If a Prophet says he received revelation from God that Buhari is going to win and another says it is Atiku, we should ask them if they are referring to the same God of Abraham or another God. I want to be sincere, as a Prophet and servant of the Most High, our duty is to talk to God to give us the right person. Rather, we have now turned ourselves to be gamblers, all because of money. If I predict that Buhari is going to win and I put on the media, I am sure the following day he will look for the way to link me and send me certain amount of money. If God reveals to me the person that will win the 2019 elections, it is my duty to go on my knees and pray about it. I don’t believe in prophecies that tell us who will win the elections. Biblically who are the ones meant to prophesy? Is it the ministers of God alone or all children of God? When you prophesy that means you are a prophet. It is these days that people are calling pastors prophets. Prophecy can come from any child of God. God can reveal anything to any of His children. You may be a Chorister, Sunday school teacher or even Gardner in the church; if God wishes to reveal anything to you He will do so. By revealing the mind of the Lord to people makes you a prophet because you are prophesying. When you are saying “hear the word of the Lord,” you are reporting what the Lord said through you. Once you are a child of God you can be a prophet, but these days, it is common to see prophets that don’t do any other work. I have been asking my followers for a very long time that why is it in CAC that ministers don’t have any other job to do. Some people will say that God has called them they are no longer doing secular work. The fact that God called you does not mean you should not practice your profession. Though, specifically there may be a few that God will tell them to leave their jobs that He wants to use them. That one is a peculiar invitation, but these days every minister in CAC doesn’t want to do any other job and that are why we will focus on the church income alone. If I have my business I can still be working for the Lord and be doing my business. If I have my regular source of income, I won’t steal the church money and won’t be relying on tithe and offerings. If I am relying on tithes alone and the church didn’t pay my salary for few months there is going to be problem. But if I have my other sources of income, I will be taking care of the needy, instead of waiting for people to give me money all the time. That is why if you see other denominations today, they are growing faster. What do you think is responsible for the high level of fake prophets we have these days in the country? Firstly, so many of them were not called by God. It is joblessness that made most of them to become Pastor or Prophet. The level of poverty in our country is also one of the reasons. Church is the easiest way to fake or deceive people. As we are talking now, if I tell you I received a revelation from God about you, you may not be able to doubt me or ask God unless you are a child of God. If you are a true child of God you will be able to ask God to talk to you. Many of the so called prophets today don’t read the Bible. If they spend one or two hours in a crusade or revival programme, they won’t spend 15 minutes talking to people from the Bible. Some of them will even tell you that they don’t know how to preach, but they can pray for several days. If you are a servant of God and you can’t tell people the mind of God which is the Bible, I doubt your calling. When you preach even without calling prayer points, miracles will happen. Ministers of God must know the Bible which is the mind of God. Any revelation that does not have its root in the Bible is fake. I have interviewed some ministers of God about what God told them about year 2019. One of them said 2019 is a year of vengeance. What has God told you about 2019? For now I am not going to say anything regarding what God told me about year 2019. Let’s continue praying for our nation. Every year is a year of vengeance. The will of God will prevail in 2019. I have read many predictions, contradicting each other. Our God is not the kind of God they are talking about. Our duty is to pray for our nation. If there is going to be evil, let’s talk to God to avert it and that is our work. Every year is a year of blessing and trouble, even the Bible says there are troubles in every day of our life. But as children of God, no matter how troubled a nation is, God will still protect His children. Congratulations on your transfer to CAC Ilorin DCC. How would you describe your three-year stay in CAC Somolu DCC? Glory be to God in the highest. Somolu DCC is another experience. Somolu is not like other places where I have worked. I have been a DCC Superintendent for several years before coming to Somolu DCC. If I am expecting what happened in Somolu DCC in Ilorin DCC, it may turn out to be a different thing. The experience I had in Somolu DCC was good. I had time to minister and teach the word of God. I had time to propagate the gospel. I worked for eight years and six months as the DCC Superintendent of Ayetoro DCC in Oshogbo, before Baba Famuyide took over from me. When I was there I used to have programmes on Television and Radio. Also, there is a programme I hold on yearly basis which I tagged “Oshogbo Fire Crusade.” I started the programme immediately I was posted to Somolu DCC. 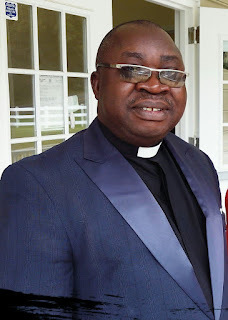 People in Somolu DCC are saying that who is going to continue the programme and I told them that Pastor S.S. Akpan that the authority transferred there will even do better. I had a very good experience in Somolu and I just pray God should give me the grace to do His will in Ilorin. I am going to be the youngest DCC Superintendent so far to work in Ilorin DCC. Ilorin DCC is a seat of church senior ministers. Now that you are now in Ilorin DCC, what is your expectation? Ilorin DCC is going to be a house of evangelism and God is going to work there. After three years people will be amazed by positive things that will be happening there. My vision for Ilorin DCC is evangelism. My vision is to ensure God liberate Ilorin, Kwara State and Babajide Region by His grace. Why is it difficult for CAC assemblies who are in the same environment to come together and hold a crusade that will shake the environment? If you want me to speak my mind because that is my nature, I don’t hide my feelings, I will tell you that Satan is really waging war against CAC ministers. There is no cooperation between us. If God is using a minister, instead of other ministers to support him, they will be saying another thing. In the Bible we have five fold ministries: if you are not an evangelist you may be a teacher, Pastor, Prophet or an Apostle. So if we can come together in unity, we are going to shake anywhere in the world. But the problem is that there is no cooperation. We are not one. I had a terrible experience when I was at Ayetoro DCC, Oshogbo. 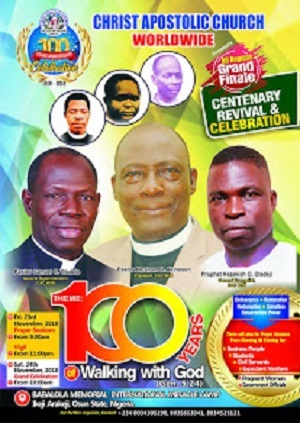 For five years we were planning to jointly hold Oshogbo crusade. Pastor Igbokwe who is now the DCC Superintendent of Apapa DCC was the Chairman of the Planning Committee. We worked tirelessly and printed about 10,000 posters, but everything got wasted only because someone thought he was supposed to be in charge of the crusade. The person thought he was supposed to minister throughout instead of sharing ministration among ministers. Because of that we were unable to hold Oshogbo crusade for five years, until God spoke to me that I should go and do it for Him and I spent my personal money to finance it to the glory of God. 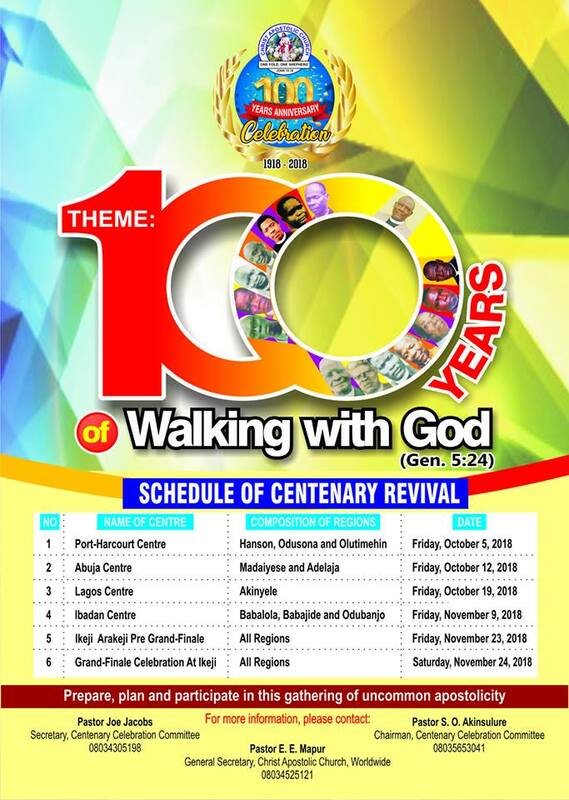 God really moved mightily and since then I have been holding the programme on yearly basis. Money is another thing that is causing disunity. Ministers will be deliberating on who is going to be in charge of money as if we are into profit-making business. Evangelism is not to gather money, though if you work hard later the result will come. If I reach into your heart, you will reach into my pocket. Another issue is that many people were not born again before coming into the ministry. There is pride and arrogance in the lives of some ministers. What is your advice to Nigerians as we are approaching the 2019 general elections? My advice to all Nigerians, particularly Christians as we approach 2019 general elections is that we should all have our Permanent Voters’ Card (PVC). If you pray from January to December, you prayers will not fill the ballot box, unless you vote. When you have your PVC you have your power to vote for anybody. If we want to be out of slavery in Nigeria, we need to forget about money politics which is very difficult because of the poverty level in the country. The politicians know this. I am appealing to Nigerians that they should vote their conscience. Vote for someone you know that will benefit you and the country at large. If they bring money to you, reject it. Let us continue to pray to God and show love to one another in this country. There must be love between the Christians and the Muslims. Every Christian should love every Muslim. Love those who are yet to accept Christ by doing this they will listen to you and you will be able to bring them to Christ. If they discovered you hate them, they won’t like you. Let us continue to pray for our nation Nigeria that God should give us the right leader and I want to tell you that the right leader may not be among those who are competing now. This is because the right don’t have billions of dollars to spend.